In our blog post last Thursday, we discussed the must-have features that every really good sports betting website must have. One of the features we discussed was multiple betting options. You remember that we promised you a comprehensive breakdown of the market in that previous post, right? Well, let’s just say this ultimate guide is a way of fulfilling our promise. You’ve probably heard of – or even placed bets in – the normal “Handicap” market; where you gift a team of your choice a goal or more ahead and make your prediction accordingly. For example, you could decide to hand Manchester United a 2-goal lead… even before their Manchester derby at the Etihad Stadium kicks off! Then, you could predict that Manchester City will win the game, despite the 2-goal handicap you’ve given them. To win the betslip, you’ll need Manchester City to beat Manchester United by at least 3 clear goals (4-1, 3-0, 5-2, 6-1, etc). But Asian Handicap works differently. In this market, teams are given a handicap – which can be positive or negative. Confused? Don’t be. It’s the same with giving a team an advantage or disadvantage before kick-off but this time, the returns on your stake come in several different ways. We know it may sound complex without giving examples. And that’s why we’ll mention a few examples as we go on. But before we do that, you need to know that in the Asian Handicap market, there are more betting lines available than in the normal handicap market. In Asian Handicap, you have betting lines like -0.75, -0.5, -0.25, 0, +0.25, +0.5, +0.75. The decimals are called midpoints and it’s the reason the possibility of a draw in Asian Handicap betting is eliminated. This means you can only bet on two options – instead of three – betting on the home or away team with a 50% chance of success. 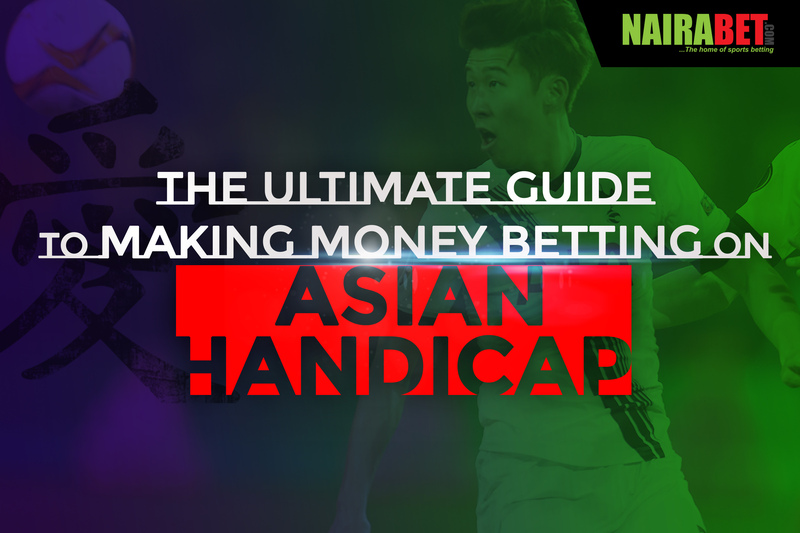 To understand Asian Handicap betting and how you can make money in this market, how about we break down each market with examples? Here, no advance is given to any team. Of course, a draw option is already eliminated and it can be regarded as something like a draw no bet (DNB). Take for example, in a game played between PSG and Monaco, the odds for AH 0 could be as follows: PSG @1.90 and Monaco @1.95. If you bet on PSG, all you need to win your breakup is a PSG win. If the game ends in a draw, you get a refund of your stake. It’s the same if you pick a Monaco win. If the team you pick loses, you lose your stake. In this betting line, there are four possibilities: Win all, win half, lose half or lose all of your stake. If you place a N1,000 stake on Dortmund to win -0.25, you need Dortmund to win the game to win #2,000, i.e. 1,000 x 2.00. Now, if the game ends in a draw, you only lose half of your stake i.e you only lose #500. If Dortmund loses, you lose your entire stake. On the other hand, if you go for a Leipzig win +0.25, you need Leipzig to win to make a #1,900 win (#1,000 x 1.90). If the game ends in a draw, you get half (#500) of your stake back and win the other half (#500 x 1.90 = #950). If Leipzig loses the game, you lose all of your stake. Regardless of which team you’re giving the advantage of a half goal before kickoff, there’s no breaking even in this market. Here, you either win or lose your bet slip. For example, if the home team has been given odds of 2.10 to win AH -0.5, you need that team to win the game to win your stake. A different result will mean you lose your money. Betting on the away team to win AH +0.5, you need that team to win or tie the game. If they win, you win your stake. If they tie the game, you still get to win the bet slip because you’ve since given them an advantage before kick-off. But if they lose, you lose your entire stake. In this market, goal margins make all the difference. We will use a recent game (Guillermo Brown vs. Chacarita Juniors) to illustrate this market. Before the game started, the 3-way odds were as follows: Guillermo Brown to win @2.40, draw @3.45 and Chacarita to win @3.10. For Asian Handicap 0.75: Guillermo -0.75 @2.90 and Chacarita +0.75 @1.40. Now, if you back Guillermo to win AH -0.75 with a #1,000 stake, you will need Guillermo to win by 2 or more goals to win the bet ticket. If they win by just one goal, you get half your stake back and win the other half (#500 x 2.90 = #1,450). If they can only manage to draw the game or they lose it, you lose your stake. If you back Chacarita (the underdog in this game) to win AH +0.75, all you need to win your stake is Chacarita to win or tie the game. If they lose by a goal (1-0, 2-1), it means you lose half of your stake (#500) and the other half (#500) is refunded to you. If they lose by 2 goals, you lose your entire stake. You see how Asian Handicap gives you the opportunity to make more money betting and at the same time saves you from losing your entire bet money in a lot of ways? The Guillermo Brown vs. Chacarita game ended in a 1-0 win for Guillermo. If you knew this would be the result, which option would you have picked before the game started to make maximum profit? After seeing all the different kinds of Asian Handicap betting lines, which one looks the most lucrative to you? And why? Which one do you see yourself betting on in the next few days? 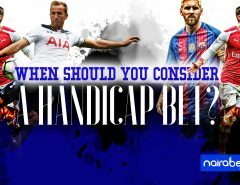 Looking to start betting in the Asian Handicap market? You need a sports betting website that offers that betting option. And NairaBET does just that, out of all the bookmakers available. If you don’t have a NairaBET account, click here to INSTANTLY open one and start betting. If after reading this you’re still confused about how Asian Handicap works, you can ask your questions by leaving a comment. We’ll definitely be available to put you through. Don’t forget to answer the questions asked above to ensure you’ve gotten a hang of how Asian Handicap works. Cheers to a new-found way of making money via betting!